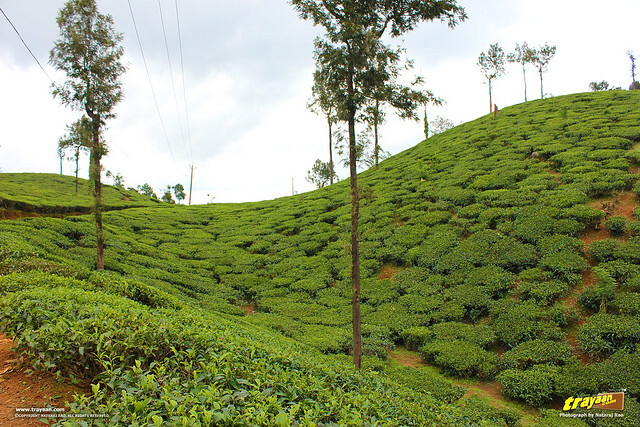 Set high on the Western Ghats with altitudes ranging from 700 to 2100 metres, Wayanad is a hill station known for its greens, mountain peaks, dams, lakes, tea plantaions and natural beauty. It was September 2011, two years ago (before trayaan was launched), when we went there on a short leisure trip. 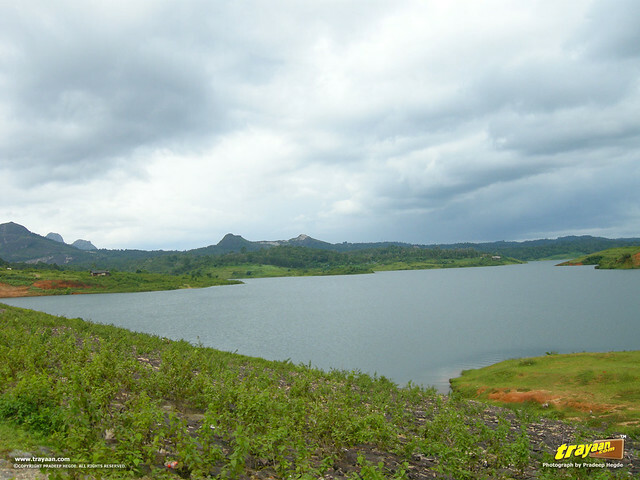 Staying at Vythri, we took small excursions to Pookot (Pookode) lake, Soochipura falls (also known as Soochipara Waterfalls) and Karapuzha dam. Here is a brief account of that trip to Vythri, Wayanad. Wayanad District, set high on the Western Ghats with altitudes ranging from 700 to 2100 m, is the least populated district in Kerala. The distict was carved out of Kozhikode and Kannur districts on November 1 , 1980. 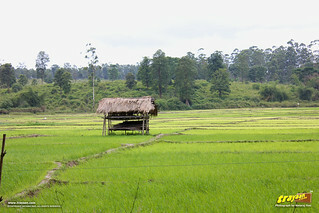 The name of this picturesque district is derived from Vayal (paddy) and Naad (land); meaning "the land of paddy fields". According to another source, the region was known as Mayakshetra (Maya's land) in the earliest records. Mayakshetra evolved into Mayanad and finally to Wayanad . 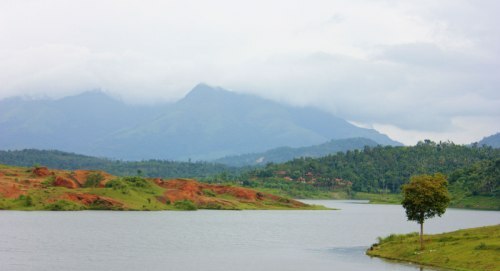 The major towns in Wayanad are, Sulthan Batheri (the largest town in Wayanad District), Kalpetta (head-quarters of Wayanad district and Vythri Taluk), and Mananthavady. September to November is when western and central areas of South India experiences light showers add to the flavor of greenery in hill stations without playing spoilsport to your sightseeing. Wayanad is 143 kms from Mysore in Karnataka, with the best path as in Google Maps, the route we took (Kozhikode-Mysore-Kollegal Highway, NH 212, (New Number: NH766)), two years ago. We went past Mysore and reached Gundlupet at 10 am in the morning. 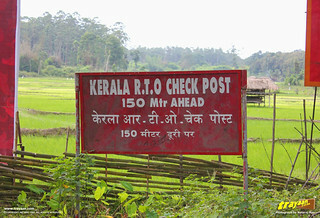 In no time we were near the Kerala - Karnataka border where we spent a lot of time doing nothing. We had to pay the state entry tax and as it was the peak season we waited for an entire hour at the check post. Those travelling by Taxi will have to pay the state tax at the check post. It cost us about Rs. 500 or 600 (this was in 2011, as I mentioned above). Generally, this cost will not be included in the total cost if you are going on a hired vehicle, and you will have to pay this amount separately. So, better check this with the transport agency or your hired taxi, before commencing your travel. We managed to reach Vythri Village resort in Vythri, Wayanad by 2:30 pm (right at the time for lunch). Not to be confused with another resort called Vythri Resorts. Remember the difference being just a word "Village" in between Vythri and Resort. 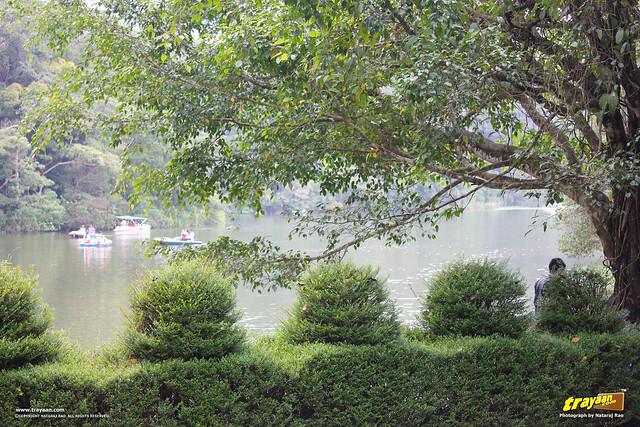 The cottage, perfectly located in the midst of greenery and serenity. All we could hear was the chirping of birds and a waterfall that most probably was artificial. The lunch was an exotic buffet with 50 to 60 vegetarian and non-vegetarian dishes. The taste was excellent and the items covered all the aspects of a 7 course meal. No wonder the resort has been given a 5 star rating. After a heavy meal and some time-off on the bed, we headed towards Pookode Lake (also spelt as Pookot Lake), and had to park the vehicle about half a km away due to the peak season crowd. The lake was beautiful, clean, well maintained with boating facility and a walkway around the lake. They sell a lot of spices, seeds and other horticulture stuff next to the entrance. 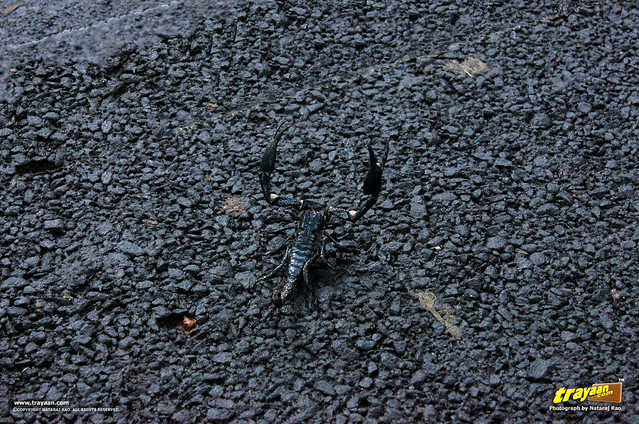 When we were heading back to our car, Pradeep saved Shreenath from getting bit by a huge scorpion. So, please be aware of the crawling creatures. It is well known that tropical places are the home to poisonous snakes, scorpions and other creatures. We reached back to our room in the evening and, spent some time near the swimming pool with the jacuzzi, went over the hanging bridge in the facility of the resort and at the man-made waterfall. After a fantastic dinner we went back to our cottage and tried sleeping. 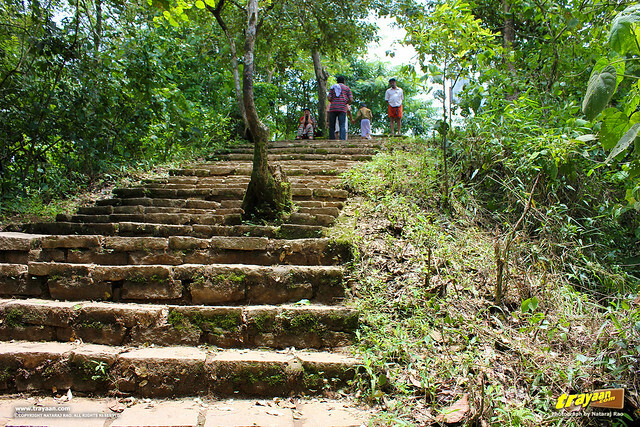 One more thing – this place is infested with leeches, just like any other typical hilly place in the western ghats. One stowaway, quite a small one, made it into our room, on my footwear. But that was the only one we encountered. Leeches are more during the rainy season. We hadn’t expected one in September, but it was a bit rainy then. Leeches thrive in humid conditions. Other than that, you will be bugged by the usual bugs like mosquitoes, which can be kept away with some odomos. The following day, we checked out of the resort in the afternoon and went to Soochipara falls (also called Soochipura Waterfalls). We had to drive through the scenic tea estates and then walk for about 2 kms to make it to the falls. There is an entry fee to the falls, but the amount has escaped our memory. Parking your vehicle can be a problem, as there isn’t much place to park properly. Also, the day we visited was a crowded day. The onward walk was pretty easy since we were going down the hill and the walk way is pretty well maintained with decently leveled steps and shade throughout the way. 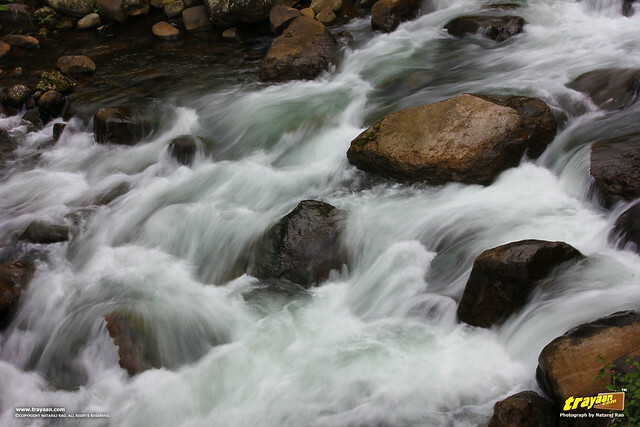 The water at the falls hits the rocks with great momentum, adding to the ambience. However, we found the place a bit congested as there were too many people packed there. Also, there isn’t a lot of place around the falls to sit or stand around. And yes, we had our eyes open for any leeches, but we did not encounter any. While returning walking uphill you may plan for some pit stops for refreshments. There are a couple of shops on the way that sell eatables, fruits and lime soda. We passed by a beautiful stream over a bridge on the road. Had some time off there and took a couple of snaps. However, I don't remember where exactly was this bridge over this stream. 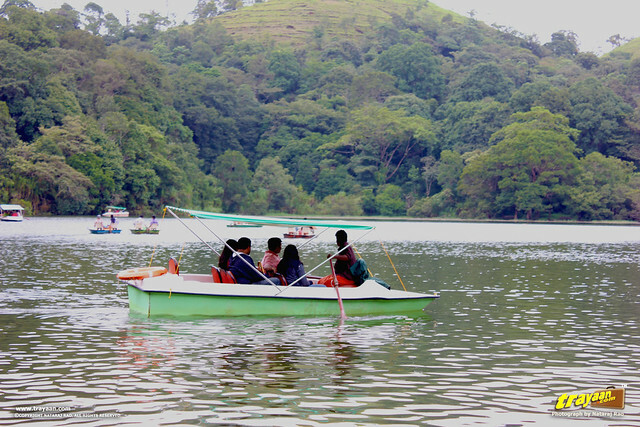 Unfortunately, due to some inevitable commitments we had to cut short our Wayanad trip and head back. 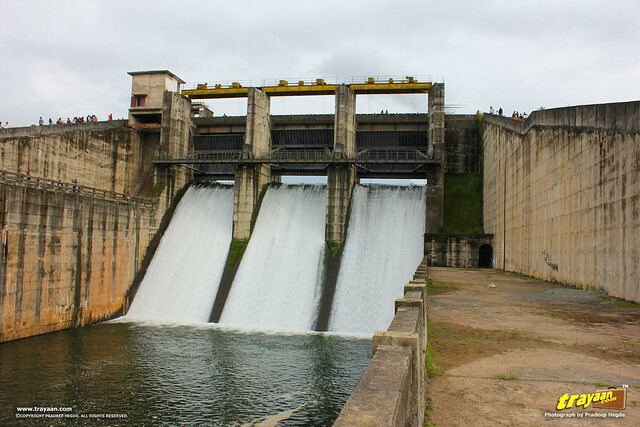 We could not see much of the main attractions like the Banasura Sagar dam which is the largest earthen dam in India and the second largest in Asia; and the Edakkal Caves, which are two of the main attractions of Wayanad. Other places we missed out are Meenmutty falls and Kuruva Island, a unique and fragile delta system on the Kabini River to list a couple of them. "What I find is that you can do almost anything or go almost anywhere, if you are not in a hurry." Well, at least that gives us a reason to go back there some other day! On our way back, we only had enough time to visit Karapuzha dam, which was about 7 kms inside from the main road. The dam wasn’t that fascinating, as there wasn’t much water in the catchment area. But it was quite scenic, as you can see in the pictures. A bit disappointed, we head back, with some delicious kerala parotas in Sulthan Batthery. 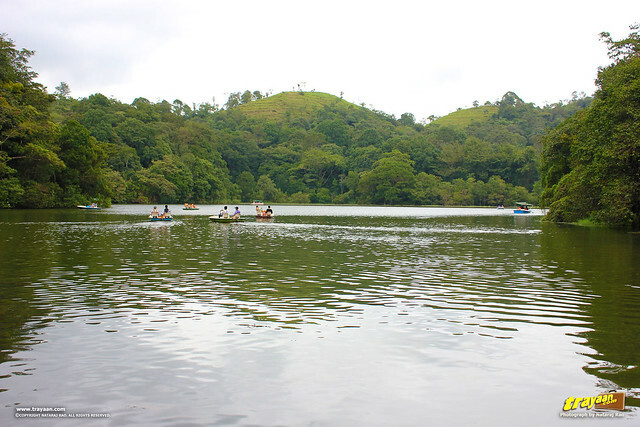 Wayanad has a lot of places worth visiting. There's Chembra Peak (tallest peak in Wayanad - 2,100 metres (6,890 ft) above sea level), Banasura Peak (2,073 metres (6,801 ft) above sea level), Brahmagiri (1,608 metres (5,276 ft) above sea level), Neelimala, and Pakshipathalam - for the trekking enthusiasts. The Kozhikode–Mysore National Highway 212 (NH 212)(New number: NH766) passes through Wayanad district. 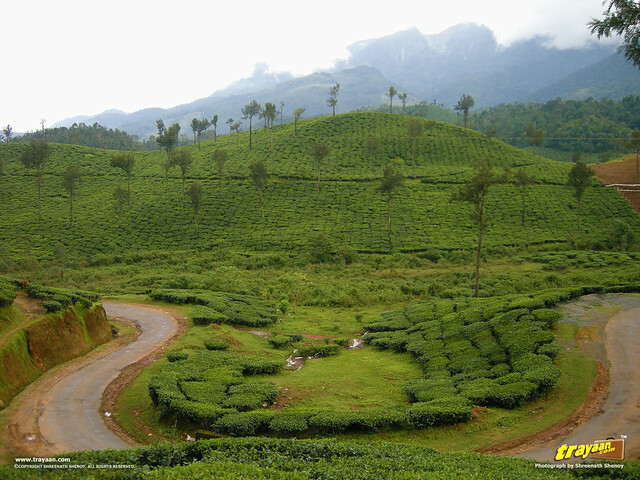 Wayanad is well connected by road to various parts of Kerala and other neighbouring states. If you are coming from Mysore side, then NH 212(New number: NH766) passes through Bandipur National Park and then through the Muthanga Wildlife Sanctuary which is on the Kerala–Karnataka state border. Some roads, especially the one to Soochipura waterfalls wasn’t in a good condition. This was a couple of years ago, and the current road condition is unknown to us. If going via own or hired vehicle, it is always better to take a vehicle with good ground clearance and power, like Sumo or Qualis for example, while going to hilly areas. We have added the places we know about. 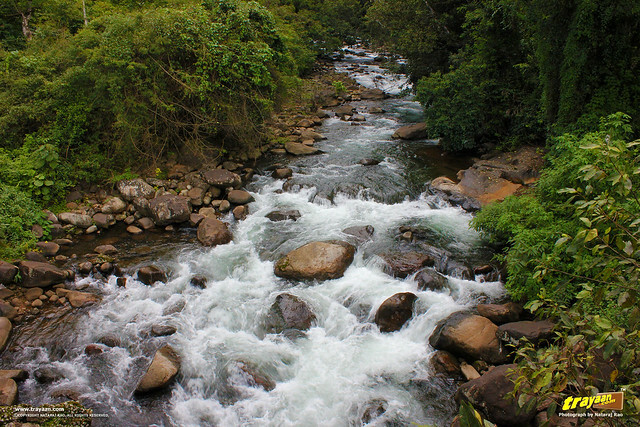 If you know any great places to visit in Wayanad we have missed to list, please let us know, leave us a comment. Note: The directions will open up with Google Maps in a new tab. 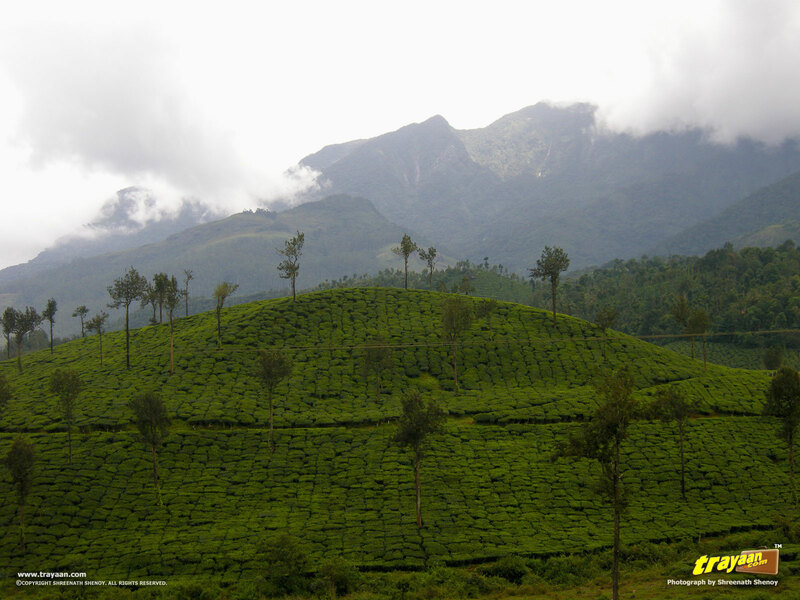 You can change your destination choice from "Kalpetta" to some other place, say, for example, "Vythri, Wayanad, Kerala". There are a lot of buses that ply through Wayanad, especially through Sultan Bathery, as it is on the main national highway between Mysore and Kozikode. However, one might have to hire a taxi or some sort of transport to get in and around Wayanad. We had booked a hired vehicle for our entire trip, including our journey. There are some good places of food in Sulthan Bathery, the largest town in Wayanad. In other interior places other than the main towns of Mananthavady, Kalpetta, there are only small joints of food. There are a number of good resorts, home-stays and other places of accommodation available in Wayanad district. All you have to do is make a nice search on the net. 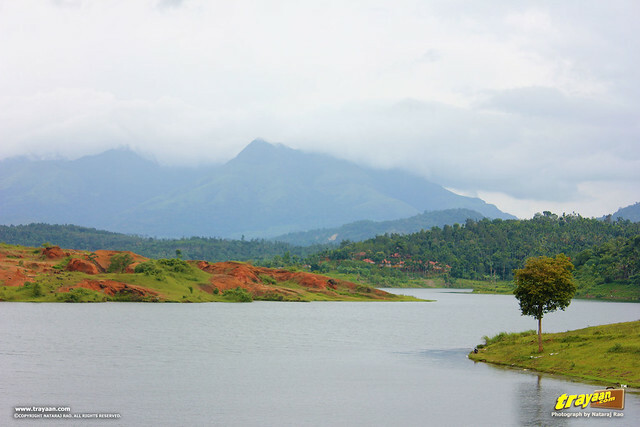 Wayanad District About Wayanad district, places of Interest, History, etc. on the Official Website of Wayanad District, maintained by the National Informatics Centre, Government of India. 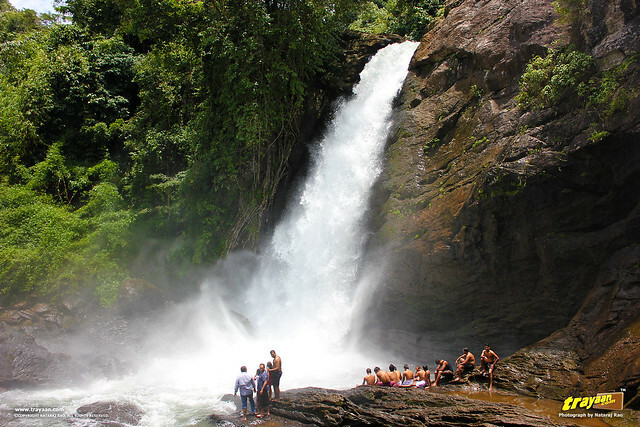 Important Tourist Places in Wayanad - on the Official Website of Wayanad District, maintained by the National Informatics Centre, Government of India. Important Tourist Places in Wayanad and Distances from Kalpetta - on the Official Website of Wayanad District, maintained by the National Informatics Centre, Government of India. Kozhikode-Mysore-Kollegal Highway, Old Number: NH 212, New Number: NH766 - on Wikipedia, the free encyclopedia, Retrieved 15:54, December 25, 2013.